GRAIN is delighted to have awarded the FORMAT Festival Portfolio Award to Sophie Gerrard for her work ‘The Flows’. This is the third time GRAIN has awarded a special prize at Format International Photography Festival. 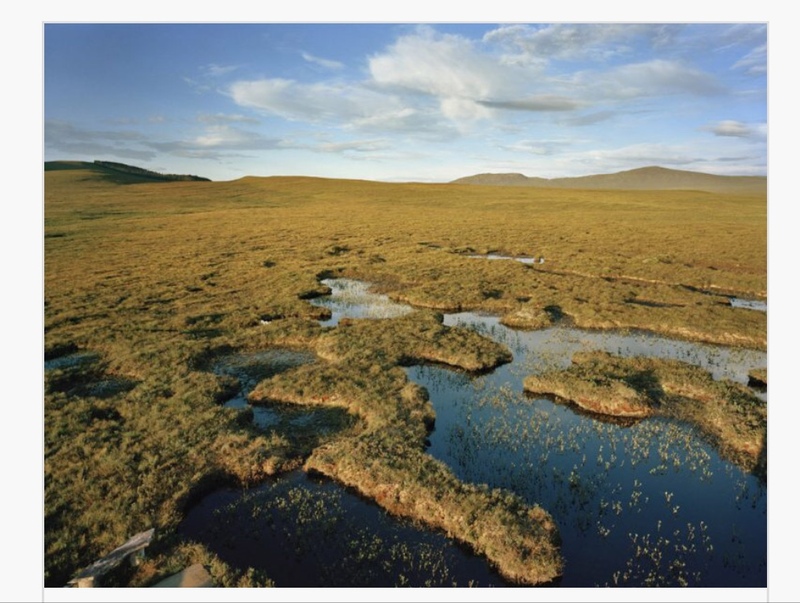 “The Flows (from the Norse ‘ floi’ meaning ‘flat, deep, wet land’) focuses on the gentle and undulating peatlands of the Flow Country, located in Caithness and Sutherland in the far north of mainland Scotland. Peatlands are a globally rare habitat vital in combatting climate change. They cover only a tiny amount (3%) of the planet’s land surface, yet peatlands hold almost 30% of all terrestrial carbon – twice as much as all the world’s forests. Scotland contains a vast amount (13%) of this vital global resource, and the Flow Country is widely considered to be the largest expanse of blanket peat bog in the world. Historically peatlands have been seen as empty and valueless wastelands, of little benefit to humans yet still forced into marginal production for the leanest of economic return. During the 1980s, the Conservative government under Margaret Thatcher offered tax incentives to the super rich, resulting in vast areas of the Flow Country being planted with non-native coniferous Sitka spruce which drained, damaged and ultimately killed large areas of the bog. Over 80% of the UK’s peatlands have been damaged by years of such mismanagement. The Flows is showing in the Document Scotland group show Contested Land – Set against the current political backdrop Document Scotland’s four photographers examine the complex relationship between the nation’s people, history and landscape. Dunoon Burgh Hall, 20th July – 18th Aug., 2019. PhotoNorth festival, 30 Nov. – 2nd Dec., 2019. Sophie Gerrard (Scottish, b.1978) is an award winning photographer specialising in contemporary documentary stories with environmental and social themes. Sophie began her career in environmental sciences before studying photography at Edinburgh College of Art followed by an MA in Photojournalism and Documentary Photography at London College of Communication. Her first major project, E-Wasteland was awarded a Jerwood Photography Award a Fuji Bursary and a Magenta Fast Forward Award. She has since been shortlisted and nominated for the Prix Pictet Award several years running and the 2015 Remote Photo Prize. Sophie’s editorial and long term personal work has been published widely by clients including The Guardian, The New York Times, The Telegraph Magazine, FT Magazine, The Washington Post, Esquire Magazine, Foto8, The British Journal of Photography, Portfolio Magazine, Lucky Peach, Le Monde and many others. Solo and group exhibitions include OFF_festival Bratislava 2018, The Scottish National Portrait Gallery (2015), Brighton Photoworks Biennial (2014), Impressions Gallery, Bradford (2014), Street Level Gallery (2014), Scotland House, Brussels (2014), Unseen Amsterdam (2013), Flowers East Gallery (2008), The Arbetes Museum (2008), Paris Photo (2008) and the Photographers’ Gallery (2012/13). Her work is held in a number of collections including St Andrews University Special Collection, The National Galleries of Scotland, Couttes Bank private collection, StatOil Collection and the Sir Elton John private Collection. In 2012 Sophie co-founded Document Scotland, a collective of internationally acclaimed photographers dedicated to chronicling the social, cultural and economic life in Scotland. Sophie is a lecturer in photography at Edinburgh Napier University, a senior lecturer at Falmouth University MA Photography online and a member of the board of trustees for Impressions Gallery in Bradford. Sophie’s work has been published in several books including “New Light” The Jerwood Foundation (2009), “Tunnock” Cafe Royal Books (2015), “The Bigger Picture”, Impressions Gallery (2015) and “Compassion, Commitment, Community” The Savitri Waney Charitable Trust (2013). Sophie is represented by The Photographers’ Gallery in London.